Dean Kelly was born and raised in Dublin, Ireland before moving to Cleveland in 2013. Dean played both ice and inline hockey in Ireland and has represented Team Ireland at several IIHF World Championships at both Division III and Division II levels. He has won both Gold and Silver medals with Team Ireland and has served as an Assistant Captain with the team. Dean was also heavily involved in the day to day administration with the Irish Ice Hockey Association. He has also been an on-ice official for the past 10 years. More recently, Dean has served as an Assistant Coach with both the ’04 Barons AAA and Ohio Flames AAA during the 2014/2015 season. The 2017/2018 season was Dean’s third season as Assistant Coach with both the Cleveland Barons AAA U14 Girls and Lake Catholic High School. He also acted as an Assistant Coach with the Gilmour Gladiators (Girls) U16 Tier 1 Team and the Gilmour Academy Girls Prep (U19 Tier 1) Team. 2018/2019 will be the second season that Dean serves as the Head Coach of the Cleveland Lady Barons U14 Black Team. Seanna Conway was born in Washington, D.C. but moved to Cleveland at a very young age, where she began playing ice hockey in the CSHL. Seanna played for Gilmour Academy Boys' Varsity in High School and played NCAA Division I ice hockey at the University of New Hampshire. She also played in the National Women's Hockey League (NWHL) for the Avalanche du Quebec (Montreal, Canada) and finished her collegiate career at York University in Toronto, Canada. She was also selected for the USA Hockey U19 Select Festival at Lake Placid, NY in 2002 finishing with the Highest Save Percentage at the Festival. Seanna played in Ireland and has represented Team Ireland at their only two appearances in IIHF World Championships (Sofia, Bulgaria in 2011 and Izmir, Turkey in 2012) winning an MVP award and Goalie of the Tournament Award. Seanna has been a Goaltending Instructor for over 15 years and has worked at camps in the Greater Toronto Area and Cleveland as well as with individual teams. 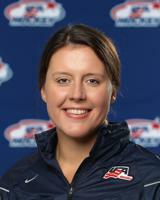 Seanna has also been selected as a Goaltending Instructor at High Performance camps by both the IIHF and USA Hockey. More recently, Seanna was the Goaltending Coach for the ’04 Barons AAA and the Head Coach of the Ohio Flames AAA U14 Girls during the 2014/2015 season. From 2015-2018, Seanna was the Head Coach of the Cleveland Lady Barons U14 Elite helping to building the program from it's inception in 2015/2016. Currently, Seanna is the Head Coach of the Gilmour Academy Girls Prep (U19 Tier 1) Team and the Gilmour Gladiators (Girls) U16 Tier 1 Team.